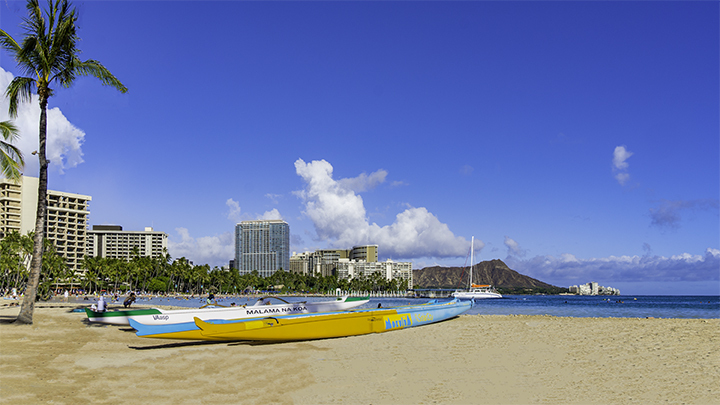 Kuhio Beach in the Waikiki area of Honolulu. Honolulu is a great place for travel, sightseeing and relaxation. Here is a sampling of the many things you can discover and do on Honolulu vacations. When one hears the name Honolulu, a tropical vacation is the first thing that comes to mind. But this Hawaiian city has depth and history far beyond the miles of beautiful shoreline and skyrise resorts. The word Honolulu comes from the Hawaiian term hono for sheltered and lulu for bay. Honolulu is city with the highest population in Hawaii. But it is also one of the most expensive city to live in the United States. Its state capitol building is one of the most visited tourist destinations in the Hawaiian Islands. The city is home to the oldest symphonic orchestra in the western United States which began in 1900. Concerts and performances are a popular attraction for those vacationers lucky enough to be in town when they are performing. Honolulu hosts the Hawaii International Film Festival annually. The event draws many film enthusiasts to the capital city. Men’s Fitness magazine had once ranked Honolulu as America’s Fittest City. This was largely because of it hosting major marathon races each year as well as offers innumerable outdoor sports and activities. Families who enjoy staying active while on vacation will love traveling to Honolulu. There are some notable districts within Honolulu. Downtown Honolulu is the financial, commercial and governmental center of Hawaii. Also within the downtown area are Honolulu’s vibrant arts and Chinatown districts. The Ala Moana area of town has the world’s largest open-air shopping center as well as other great shopping, entertainment and dining complexes. Waikiki is the world famous tourist destination area of Honolulu. Waialae and Kahala are the affluent districts of Honolulu. These areas are just east of Diamond Head, where there are many expensive homes, the Waialae Country Club and a five-star resort. View of Diamond Head from Waikiki. Le’ahi Crater, or Diamond Head, is an extinct volcanic cinder cone and is one of Hawaii’s most famous natural landmarks. Because of its strategic prominence, it once had five military batteries and fortified observation points within the sides of crater. The Army built them between 1910 and 1943 and they can still be seen today. Queen Lydia Liliʻuokalani, the last monarch of Hawaii reigning from 1891 to 1893, was born in Honolulu. The French, Russians and British occupied Honolulu on different occasions. This occurred before the US annexed Hawaii as a territory in1898. Hawaii did not become a state until 1959. Hawaii has a strong Asian influence and a diverse culture. So it is not surprising that Honolulu has over 30 Buddhist temples. This makes the city one of the largest concentrations of practicing Buddhists in the US. The city’s climate is semi-tropical and the trade winds keep Honolulu fresh and cool. But the warm southern winds, called Kona wind, blow during summertime, the weather becomes hot and muggy. 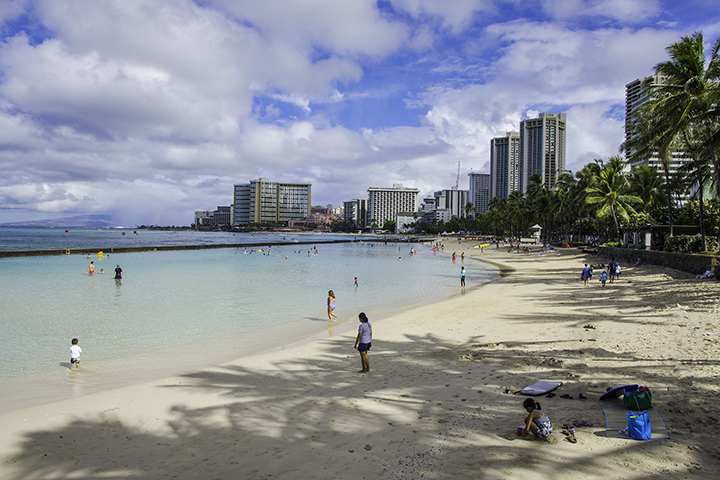 Honolulu produces the least amount of seasonal variation of all the cities in the US. This makes the town a prime honeymoon and vacation destination for those seeking warm weather year round. Temperatures vary only a few degrees in winter and in summer. The average temperature ranges being between 80 to 90 degrees Fahrenheit in July and 65 to 75 degrees Fahrenheit in January. Downtown Honolulu has a number of historic buildings. It is home to Washington Place, the governor’s residence. Here, you can also find Honolulu Hale, the city hall of the City and County of Honolulu. Nearby is Kawaiaha’o Church established by American Protestant missionaries during the early 1800s. 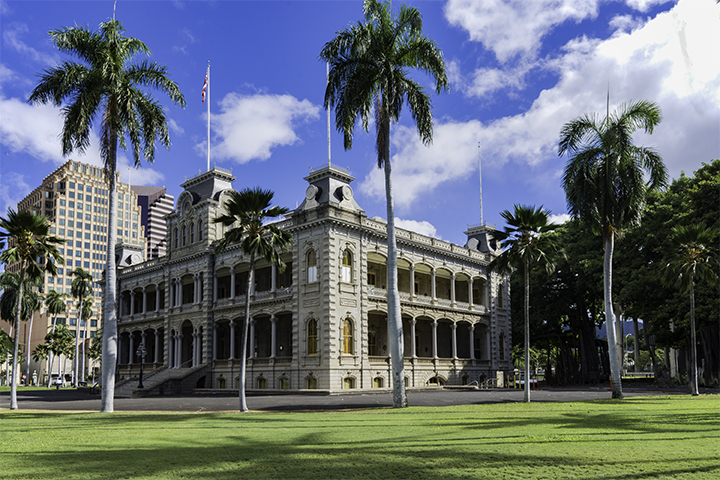 Another downtown must-see is Iolani Palace. It is the only royal palace in the United States and is a fascinating place to visit. The Mission House Museum displays artifacts from Hawaii’s 19th century missionary period. The museum has three notable buildings. First is the Oldest Frame House, a communal missionary home that was originally crafted in New England. Then builders shipped its parts to Honolulu where local carpenters pieced it back together. The second is the Chamberlain House, a home built from coral blocks cut from local reef. And finally, the Print House, a reef-block covered porch and balcony next to the Chamberlain House. Chinatown Art-Walk is a must-do for all art-lovers on their trip to Honolulu. Tours are from 5 pm to 9 pm on the first Friday of every month. Chinatown also hosts a dynamic art walk featuring unique galleries, boutiques, cafes, trendy bars and restaurants. The Hawaii Theatre in downtown Honolulu opened in 1922, painstakingly restored in 2005 and is one of the outstanding historic theaters in America. Foster Botanical Garden opened in 1855 and is the oldest botanical garden in the State. Bishop Museum is Hawaii’s largest museum, showcasing the culture and artifacts of ancient Hawaiian history. Pearl Harbor is a must-see on Honolulu vacations. Pearl Harbor is the historic place where Japanese naval aircraft attacked the US fleet on December 7, 1941. This prompted the United States’ entry into World War II. 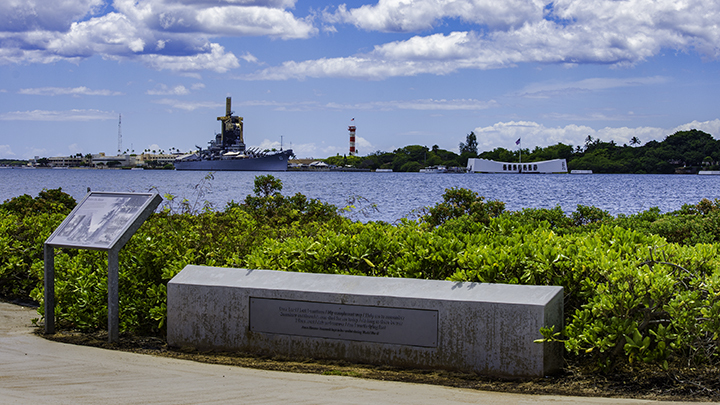 Several notable memorials and museums in Pearl Harbor draw millions of visitors each year. The USS Arizona Memorial is the resting place of 1,102 sailors and marines still entombed within the battleship’s sunken hull. The USS Battleship Missouri Memorial showcases the ship where Japan offically surrendered to the Allies in 1945. USS Bowfin Submarine Museum & Park displays one of the few surviving World War II submarines left in the world. While the Pacific Aviation Museum displays a collection of classic World War II aircraft. The US Army Museum of Hawaii showcases warfare artifacts and memorabilia as well as Hawaiian history from King Kamehameha from 1738 to the present day. Honolulu is the ideal city to travel to on your vacation. Those that are lucky to take Honolulu vacations will find experiences rich in history, culture, arts and entertainment.